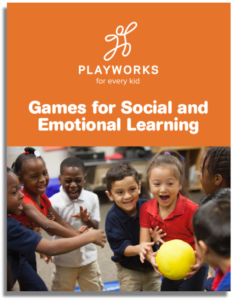 Download a new guide to more than 150 games that will help kids practice social and emotional skills. Find games by skill, grade level, time and space available, and more. Games have always helped children practice the life skills they need to thrive. The oldest game in our new guide “Games for Social and Emotional Learning” is more than 2,000 years old. The newest games, invented at Playworks partner schools, are just a few years young. The games in this guide can be played anywhere, but we have assembled them with schools and youth-serving organizations in mind. In these settings, the challenge is not just to introduce games kids will love but also to ensure that dozens of children can share space safely and respectfully whether in a classroom, a gym, or outside. The games in this guide aim to keep as many kids playing as possible for as long as possible. Read about the research behind this guide. 150+ games: New variations on classic group games, classroom brain breaks, and plenty of recess favorites that kids can lead on their own make it easy for kids of all skill levels to benefit from play. Facilitation tips: Shared norms for how to tag safely, how to resolve small disagreements, and who can join in (everyone) go a long way toward making playtime safe and inclusive. We’ve included a number of strategies for introducing new games and ensuring that playtime goes smoothly. Indexes: Search quickly by social/emotional skill, grade level, group size, time available, and location to find the best games for your group. For more than 20 years, Playworks has helped schools and youth organizations through on-site staffing, consultative support, staff training, and most recently, online learning. We are a mission-driven nonprofit committed to the power of play, and we hope this guide will be helpful for your team as well! Want more support for playtime at your school or organization? Let us know.